At our synagogue in Westport, Purim celebrations always featured our friend Larry, who, surreptitiously in the kitchen, whips ups blender after blender of Margaritas for the grown-ups, who enjoy them out of the same paper cups the kiddies get juice. So I guess you could say, the kids get juice while the adults get juiced. When Joy of Kosher invited bloggers to submit inventive Hamentaschen recipes, those margaritas came to mind. But these are not just a gimmick, they are really good! I have written before about Hamentaschen, a rather poetic post I really like, so try those, or try these. These are really fun and delicious! 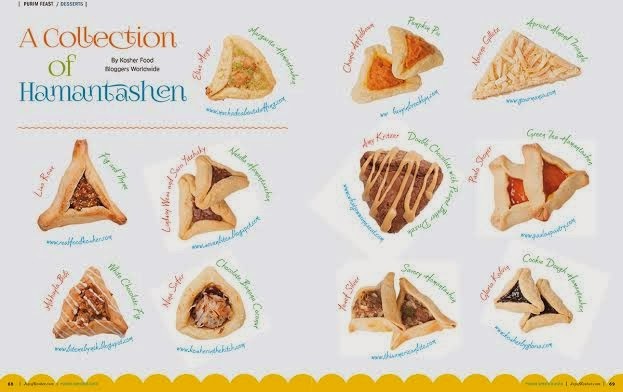 If like many of us, you have the problem of your hamentaschen coming open in the oven, this blog, that I really like has a technique that you might want to try. 1. Make a batch of your favorite Cream-Cheese Pastry, or use this one from Epicurious which works well, adding grated zest of a large lime. Divide and roll to ¼” between sheets of Parchment. Chill well. Mix all ingredients and chill at least 2 hours. Mix ¼ cup confectioners sugar with 2 Tablespoons lime juice and grated zest of a large lime. Working quickly, one sheet of dough at a time, cut circles, brush with Lime Glaze, center a scant teaspoonful of the filling, and pinch closed on three corners being sure they are well sealed. Brush again with Lime Glaze. Place on a silpat-lined cookie sheets. Refrigerate for at least 15 minutes to firm up. (or freeze, well wrapped to bake later). Bake in preheated 350 oven 20 minutes until golden on the edges. Cool on wire racks.